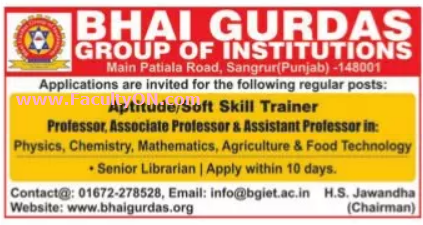 Bhai Gurdas Group of Institutions, Sangrur has advertised in the TRIBUNE newspaper for the recruitment of Professor / Associate Professor / Assistant Professor Plus Non-Faculty jobs vacancies. Interested and eligible job aspirants are requested to apply within 10 days from 11th July 2018. Check out further more details below. College Profile: Bhai Gurdas Technical Education Trust, named after the great scholar & poet Bhai Gurdas Ji, was established under the guidance of S. Hakam Singh Jawandha, a man of great vision and dynamism. The governing body of trust includes many educational administrators, educationists, industrialists, and public men of great repute, who have long experience of establishing and managing educational institutions. The trust, being the matter of pride for the historical city of Sangrur, has established a chain of institutes. How to Apply: Interested and eligible candidates are requested to send application along with CV, copies of certificates and recent PP size photo to the following email address or postal address.